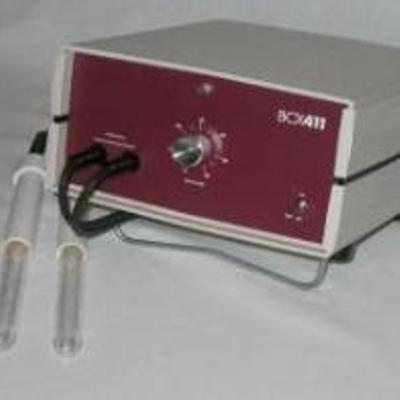 We will repair all functional problems of your BCX411 Raytube, adjust, and calibrate it. We provide a 1 year Warranty on our work. There is a flat rate for this repair service, and it includes return standard shipping within the United States. If the Red light comes on, the power supply is probably OK. If you have a BCX411 Raytube that does not work properly, but your BCX211 Electrode works properly with electrodes, there is probably nothing wrong with your BCX211 Electrode. Put a note in the box with your name, email address, telephone number, and a description of the problem the unit has. Important: Send the grey cord that connects the BCX411 Raytube unit to the BCX211 Electrode. Pack a BCX411 Raytube with raytubes and power supply in a USPS Medium Flat Rate Box-1 OFRB1I (11" x 9" x 6"). If you are sending a black power supply with your unit, use a USPS Large Flat Rate Box LARGEFRBI (12" x 12" x 6"). Use a little padding such as small bubble wrap, foam, or crumpled paper towels on the bottom and sides. Fill the box above the unit with the same type of padding. If you are sending Raytubes, wrap each indivually with padding around the side and end of the glass portion.